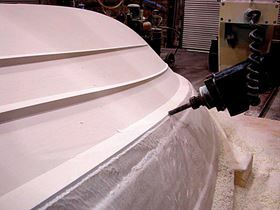 To produce conventional tooling, Mollicam uses a 5-axis CNC router to machine a hull pattern, or plug as it’s known in the marine industry. The mould is made from the plug. 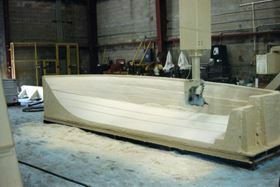 Foam is machined using a 5-axis CNC router for a direct-to-mould boat hull project at Mollicam. Janicki Industries developed and operates this advanced, super-size CNC router, which provides a maximum envelope size of 100 ft x 20 ft x 8 ft (30.5 m x 6 m x 2.4 m). FormaShape, one of North America’s largest manufacturers of composite parts and tooling, built this mould especially for Light RTM processing. Composite mould for the manufacture of a lightweight, composite racing boat seat was made using CFOAM® from Touchstone Research Laboratories. Multibag™ reusable silicone rubber bagging system from Airtech Advanced Materials is used with vacuum infusion tooling. Surface Generation’s subtractive pin tooling was used to CNC machine this tool using aluminium pins. Blocks of coal-based CFOAM® are bonded together prior to being machined to produce composite tools. RAMPF Eco tooling board, produced with recycled polyol, exhibits a very fine surface structure, excellent machinability and low CTE. Layered strips of unidirectional BMI carbon fibre prepreg are consolidated onto rolls to produce HexTOOL M61 tooling material. 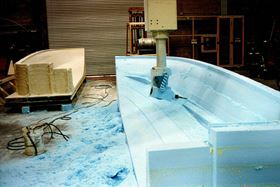 Engineered putty applied over the foam is machined to finish the direct-to-mould hull mould at Mollicam. Invar, a nickel-steel alloy, has long been the tooling material of choice for high-volume runs of composite parts because of its durability and a coefficient of thermal expansion (CTE) which is close to that of the reinforced plastics used to mould the parts. But as composite parts have grown increasingly larger, the excessive weight of the metal tooling used to make them has created new challenges in the processing plant. As a result, many manufacturers have turned to composite tooling to reduce the mass and avoid the high cost of machining Invar. More and more tooling is being built using epoxy and carbon fibre, particularly where dimensions or mould stability are critical, relates Bob Lacovara, former technical director of the American Composites Manufacturers Association (ACMA). “Developing the technology to get a good Class-A surface will be the next step. That will be pretty radical in terms of the overall cost and time savings for tooling,” observes Lacovara, who heads Convergent Composites, a consulting business. 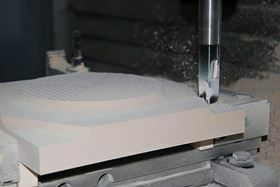 Mollicam, a mould manufacturing shop in Florida, USA, that utilises 5-axis CNC machines to produce patterns, prototypes and moulds for composite manufacturing, has machined direct-to-mould tooling for temporary and limited-production moulds. The shop operates four CNC machines, producing moulds, boat hulls and other composite parts. One direct-to-mould project was for boat builder Wellcraft Marine Corp.
Mould materials depend on what the customer is using to make the parts. CNC machining from computer data is highly accurate. Machinable composite tooling blocks and board materials are available from various manufacturers for the production of master models and tools. These products range from polyurethane foam and syntactic epoxy to carbon foam. The materials are bonded together then machined to define the tool shape, sealed to prevent laminate resin infiltration, and encapsulated in a bismaleimide (BMI) or epoxy laminate for final machining. 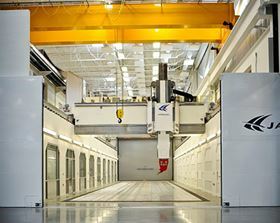 One of the world’s largest CNC routers was developed by Janicki Industries, a leading US manufacturer of composite tooling based in Washington state. The machine provides a maximum envelope size of 100 ft x 20 ft x 8 ft (30.5 m x 6 m x 2.4 m). Unlike most other 5-axis machines, its wrists incorporate a ‘contra-torque’ arrangement. Each wrist joint has two motors that oppose each other to eliminate back-lash, which minimises vibration and acceleration problems. Airframe structures continue to add more composites and are getting ever larger and more complex, according to Bob Vale, Manufacturing Development Engineer at Northrop Grumman Aerospace Systems. 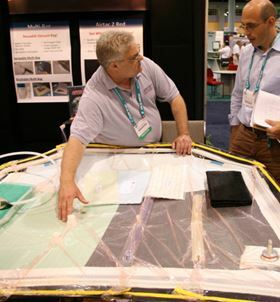 Speaking at the Society of Manufacturing Engineers (SME) Tooling for Composites Conference in San Diego, California, last year, he recounted that Northrop had selected BMI as the optimum composite material for tooling early on, and it continues to be successful in the aircraft manufacturer’s programmes. Over 600 BMI tools have been designed and fabricated to support Northrop’s production programmes. Typically, the tools, which are at least 60% lighter than equivalent Invar tools, go through more than 700 autoclave cycles at 350°F (150°C) at 100 psi, Vale related. One of the challenges with using composite materials for aerospace tools and lay-up mandrels is meeting the stringent material demands. Specific requirements include being able to perform for a minimum of 500 cycles and having a glass transition temperature over 400°F in order to meet the 350°F cure temperatures used for high production rates. The tooling must also be cost effective, UV resistant, damage tolerant and able to resist environmental degradation while maintaining a high degree of dimensional integrity and stability, he explained. The move by aircraft manufacturers toward more composites has driven the development of BMI and other advanced materials, opening new avenues in composites tooling, according to Larry Carver, president, Carver Composites Tooling in Lynnwood, Massachusetts. Carver, who also spoke at the SME Composites Tooling conference, noted that Northrop started exploring the use of epoxy-based composites tooling materials in an attempt to match the predictable CTE of carbon parts in its F/A 18 A/B Hornet. Today Northrup uses about 59% carbon fibre in its Super Hornet, noted Carver, who developed a concept to create composite tooling for large composite structures using carbon foam core and BMI/carbon fibre skins. He observes that BMI, carbon fibre and carbon foams are ideally suited for large lay-up mandrels to support the fabrication of composite skin assemblies for automated fibre placement and hand lay-up. Well-suited for autoclave tooling is Hexcel’s HexTOOL M61, produced from HexPly® M61 BMI resin. It incorporates randomly layered strips of unidirectional carbon fibre prepreg, which are consolidated into a rolled material. HexTOOL can be utilised as multi-ply quasi-isotropic hand lay-up material and CNC machined to close tolerance, relates Hexcel. The material, well suited for 350-375°F autoclave curing, is repairable and dimensionally stable, offering the ability to hold vacuum integrity – even after more than 500 part-cure cycles. HexTOOL tools are lighter and more energy efficient than tools made of steel or Invar and more cost-effective with tighter mould tolerance than standard composites, says Hexcel. The company also offers HexTOOL M81, an epoxy version that is composed of prepreg mat bundles in a quasi isotropic orientation and is thicker than standard composite tooling material. Designed for the production of 248°F (120°C) curing parts, the tooling prepreg is autoclave cured at 260°F (125°C) for six hours, followed by a post cure of two hours at 400°F (205°C). DURATOOL 450 BMI/carbon fibre tooling prepreg from Cytec Engineered Materials is a high-performance tooling system that is capable of continuous service at 375°F (190°C) and short-cycle service at 400°F (204°C). After autoclave processing for the initial cure, the tool laminate can be demoulded and post-cured ‘free-standing,’ notes Cytec. The prepreg has been proven capable of more than 1000 autoclave cycles at 375°F without deterioration. Other tooling prepreg systems from Cytec include CYFORM 7620, a medium-temperature-curing epoxy system with maximum tack and long working life for large, difficult-to-lay-up tooling. Advanced Composites Group (ACG) recently introduced two additions to its range of BMI matrix systems. Designed to offer superior handling, performance and high temperature capability in the structural tooling and component markets, HTM® 556 and HTM 515-1 tooling prepregs are said to exhibit improved toughness and resistance to micro-cracking for improved vacuum integrity and extended tool life. HTM 556 offers continuous service temperatures of 392°F (200°C), while HTM 515-1 can tolerate thermal cycling to 480°F (250°C), reports ACG. The company also offers the LTM® series of low-temperature-cure, epoxy-based prepregs, which can be post-cured to produce high-temperature-capable, lightweight composite tooling using low-cost, low-temperature master models. Another product is ACG DForm™ Deformable Composite System Tooling Prepreg, billed as a labour and cost saving prepreg technology combining the conformability of a short fibre moulding compound with the directional characteristics of a high performance long fibre composite. Amber Composites offers the HX series of low temperature epoxy tooling prepregs, including HX42, which has a five day out-life and an end-use temperature of up to 392°F (200°C). Another product in the series is HX90N, which uses nano-modified epoxy resins for improved surface flatness and finish of tools. The prepreg is said to provide a combination of exceptionally low thermal expansion (60-70% lower than comparable materials) with an excellent finish off aluminium or epoxy patterns and high end-use temperatures. GrafTech International’s GRAFOAM® carbon foam can be used successfully in composite tooling applications as a core material. Made of isotropic carbon, the foam provides a close CTE match to carbon fibre composites and very high temperature capability. ACG teamed up with GrafTech to develop the ACG GRAFOAM FPA-20 carbon foam tooling system. The material offers high compressive strength, is lightweight, dimensionally stable, and it can eliminate the need for a master model. 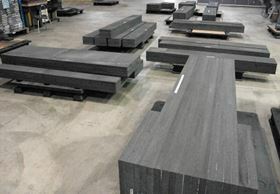 Blocks, which are bonded together to form large structures, are available in a variety of sizes and densities. ACG offers CB1100 ceramic tooling block material with high temperature capability and low CTE that is said to produce exceptionally accurate and stable tools. Compatible with ACG’s LTM® epoxy and HTM® BMI tooling prepregs, the ceramic blocks are bonded together and machined to form a tool core, then laminated with a carbon fibre skin, eliminating the master model. Since the skin is fully supported by the ceramic core, there is no need for a backing structure, observes ACG. No drying or subsequent venting are required because the ceramic material does not absorb water. Touchstone Research Laboratory offers CFOAM®, a structural material made from coal in a cost effective, high pressure proprietary process that is used in a range of applications, including composite tooling. It can be produced in a variety of forms and surfaces, from thin sheets to near-net-shape 3D components, and tailored by cell size and density. The foam has been used to create inexpensive prototype tooling surfaces for less than 10 parts as well as production surfaces capable of 500 or more parts, the company reports. 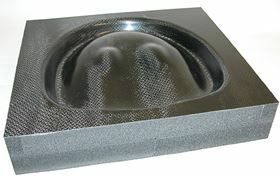 The high strength CFOAM material can be cut and machined with conventional equipment and can accommodate metalised coatings using flame spray techniques. After prototype parts are made, the prototype tool surface can be machined off and a production viable composite surface can be applied. The opportunity also exists to make design changes with minimal additional costs, notes Touchstone. 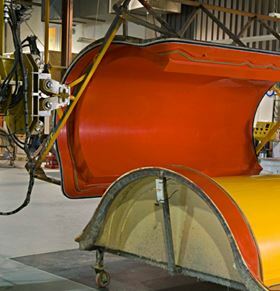 Amber Composites offers tooling boards, primers and sealers along with support boards, which provide extra stiffness and stability to composite tooling. 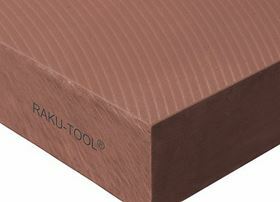 Amber Composites and RAMPF Tooling have introduced an epoxy board for tools and moulds and an epoxy paste as part of RAMPF’s RAKU-TOOL® range of epoxy and polyurethane products. The WB-0700 epoxy board is said to provide a very fine surface structure, excellent machinability, good dimensional stability and high heat resistance. Amber’s Cellite® 180 range of tooling support materials, which provide a temperature resistance of 180°C, are available as glass or carbon skinned boards, with or without perforated aluminium honeycomb cores. Also available from Amber are solid gusset panels, laminated from carbon or glass fibre with high temperature capable resins. The panels are cut to shape and used to support large tools or parts during lay-up and cure. Sika Tooling & Composites produces SikaBlock® model and tooling boards in 13 different types in a range of dimensions and densities. SikaBlock M2010 offers high heat resistance, low thermal expansion and a very dense surface suitable for producing composite tooling. The company also manufactures the Biresin® product family of high performance resins and pastes for mould and model making as well as part production. BCC Products/Blehm Plastics manufactures a high temperature epoxy tooling board, EB6200, which features temperature capability of up to 325°F (163°C), as well as excellent cutting performance, creating little dust, notes the company. BCC also produces rigid, closed-cell, polyurethane foam tooling boards in a variety of specifications suited for master models and prototype tools. Also available is MB5000 high density urethane tooling plank, which can be used for metal forming as well as nickel plating mandrels, and MB8250 aluminium tooling plank. Gurit offers both ambient curing tooling products and SPRINT® tooling materials for curing at 150°F (65°C), offering ultimate thermal performance of 320°F (160°C). An epoxy gel-coat system, SP T-Gel 130-1, is designed for glass or carbon fibre tooling. It is compatible with SP’s range of 266°F (130°C) tooling laminating, infusion and repair materials. Gurit recently announced that it had signed an agreement to acquire the Suzhou Red Maple wind blade mould manufacturer in China. Plans include expanding the mould offering globally, supported by its existing global distribution network and composite technology base, Gurit reports. Surface Generation Ltd, a UK-based technology company, developed and supplies its patented reconfigurable pin tool manufacturing equipment, which can be used in a broad range of applications. The technology is designed to reduce tooling lead time and costs by up to 90% and cut product time to market by up to 40%, according to Ben Halford, CEO. He notes that part quality is also improved through in-process control. Two separate reconfigurable systems are available: Near-net-shape Pin tooling (NPT) and Subtractive Pin Tooling (SPT). Beds of adjustable square pins, which can be made from any metal, are positioned to form a near net shape support structure for composite tooling. Once the pins are adjusted to near net shape, they are machined to form the front face of the tool. Halford predicts a significant impact can be made on the composites industry by taking a whole-life-cost approach to mould production using reconfigurable and machinable pin tooling fitted with conformal heating/cooling. The pins, which can be machined or replaced to accommodate dimensional changes in a part, feature integrated heating/cooling channels that allow the tool to be heated from ambient temperature to 800°F (427°C) and back to ambient in 12 minutes. With controlled heating built into the tool, the autoclave can be eliminated in advanced composites parts production, observes Jay Mulligan, who is working with Surface Generation’s US partner Reno Machine Company in Connecticut. Reno will manufacture tooling using Surface Generation’s technology. Cass Polymers manufactures a full line of Tool Chemical Composites (TCC) tooling planks, including an aluminium-filled polyurethane board designed for CNC machining of production fixtures capable of withstanding extended use and handling. High temperature epoxy and intermediate temperature urethane planks are also available for tooling, among other products. Nord Composites produces Zero Shrink™ one-component tooling resin systems for the rapid production of composite moulds. RM2000 tooling resin is an unsaturated polyester product which is filled and pre-accelerated for hand lay-up and spray-up of tooling. RM3000 vinyl ester tooling resin is a low exotherm system that can be used to replace epoxy moulds and to create heated moulds, as well as thermoforming tools. Both systems have a long shelf life of six months. They are distributed in North America by Nida-Core Corp.
Cook Composites and Polymers (CCP) manufactures OptiPLUS™ high performance low-shrink bulking resins for making moulds for hand lay-up and spray-up processing as well as for vacuum infusion processing at ambient temperatures. OptiPLUS 040-8091 is a candidate to replace isophthalic, vinyl ester and epoxy resins in tooling applications for both ambient and elevated temperature processes in vacuum infusion. It is a pre-promoted resin containing reactive monomers, providing exceptional surface quality and excellent heat resistance, relates CCP. Airtech Advanced Materials Group manufactures vacuum bagging and composite tooling materials for infusion, hand lay-up and oven/autoclave cures up to 750°F (395°C). Toolfusion® epoxy tooling resins are available to produce composite tooling using infusion techniques, which are cleaner and easier than traditional lay-up or spray-up processes, notes Airtech. 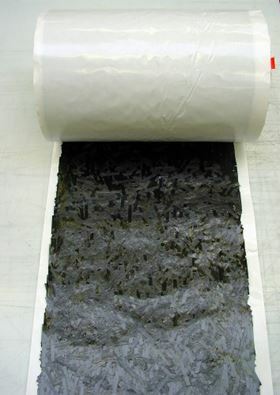 The company also carries an Econo line of vacuum bagging products, including the Multi-Bag™, a reusable silicone rubber bagging system, which is sprayable and brushable. The low-viscosity liquid silicone paste is applied over a reinforcing mesh material, curing in 48-72 hours in ambient air. Composites One, the largest North American supplier of composite materials and supplies, organised the Closed Mold Alliance with three partners to provide turnkey closed moulding solutions and training. Equipment manufacturer Magnum Venus Plastech (MVP) and tool manufacturers RTM North and FormaShape are the other participants. FormaShape, based in British Columbia, Canada, is a leading manufacturer of tooling for light resin transfer moulding (Light RTM), specialising in 5-axis milling and pattern building. Invar tooling for fuselage structures can weigh as much as 300 000 lbs (136 078 kg), which limits the lay-up rate for automated fibre placement and extends thermal cycle times for autoclave curing, observes Tom Sobcinski, Tooling Segment Manager, Remmele Engineering, in Minnesota, USA. In an effort to reduce the mass and size of conventional Invar tools Remmele developed a patent-pending hybrid tooling system, Invalite™. The Invalite system incorporates a thin Invar face sheet over a composite back-up structure to reduce weight. It combines the long life and quality of Invar tooling with the lightweight properties of composite tooling for large- and moderate-scale parts. The system uses lightweight materials, joined through Remmele's proprietary ConnexSys® technology, resulting in 50% weight reduction over conventional Invar tooling, Sobcinski relates. Invalite tools are said to hold up better to stress and use over traditional Invar tooling. The first production Invalite tool was used in the manufacture of composite parts for tactical aircraft last year under the auspices of a team which included Lockheed Martin Aeronautics and Remmele. Sobcinski planned to make a presentation on observations of the hybrid tooling during its first year of use at Composites Manufacturing 2010, the Society of Manufacturing Engineers (SME) conference in San Diego, California, set for 20-22 April. Sobcinski discussed the observations with Reinforced Plastics prior to the conference. Tool maintenance varies widely across the industry, observes Bob Lacovara, former ACMA Technical Director and now principal consultant at Convergent Composites. He defines it as paying attention to the mould and doing the appropriate preventive maintenance before any damage occurs to the tooling surface. Compared with an all-composite tool, the primary benefit of Invalite is durability. “The Invar face sheet won’t deteriorate,” he adds. 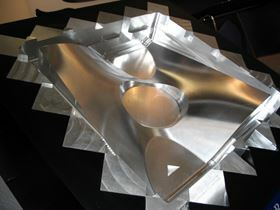 Hard tooling is also made using metal deposition techniques. Weber Manufacturing Technologies in Ontario, Canada, produces nickel-shell tools with proprietary nickel vapor deposition (NVD) technology in the largest, most advanced commercial facility of its type. The two-stage chemical process converts bulk nickel powder into solid nickel shells over heated mandrels, resulting in nearly pure nickel with no residual stresses. Weber also produces tooling with integral heating for out-of-autoclave processing. Another company, Keystone Synergistic Enterprises in Port St. Lucie, Florida, USA, produces low-cost rapid tooling using proprietary metal deposition technology to form the faceplate of tools and for tool repair. Electron beam metal deposition processes generate near-net-shape 3D geometries that meet aerospace quality standards for titanium, nickel and steel alloys, says Keystone. This feature will be published in the May/June 2010 issue of Reinforced Plastics magazine.